With what materials was this palace built? In truth, with the most costly, for she, being like precious stone, was of royal lineage, descended from David, who placed a stone in his sling, and with it killed Goliath. The stone foreshadowed the Stone that is Christ, fashioned, as it were, from aromatic woods, of cedar and cypress. The Virgin Theotokos was born of priestly ancestors as well, who offered God sweet smelling sacrifices. Her father, the Holy Righteous Joachim, was the son of Barpather, who traced his ancestry to Nathan, the son of David. Her mother, the Holy Righteous Anna, was the daughter of Matthan the priest, who was of the line of Aaron. Thus, the Most Pure Virgin was by her father of royal descent, and by her mother, of high priestly lineage. Of what precious materials, from what an ancestry was the most illustrious, animate palace of the King of Glory fashioned! As structures built of stone and wood in Solomon's palace were esteemed all the more for the pure gold with which they were covered, so in the case of the Nativity of the Most Pure Theotokos, the nobility of her royal and high-priestly lineage is rendered yet more honorable by the chastity of her holy parents, which is more to be valued "than thousands of gold and silver. She is more precious than costly stones, and nothing that is dear is to be compared to her" [Prov. 3], for the Most Pure Virgin was born of parents possessed of chastity, which is loftier than all nobility, as the Holy Damascene testifies, writing of the Righteous Ancestors of God thus, "O blessed couple Joachim and Anna! Truly, by the fruit of your loins are you known to be blameless, according to the words of the Lord, 'You shall know them by their fruits' [Matt. 7]. You ordered your lives in a manner pleasing to God, and worthy of her who was born of you. Having lived in chastity and righteousness, you brought forth the treasury of virginity, the Virgin, who was a virgin before giving birth, as she gave birth, and even after she gave birth. She alone, being in mind and soul and body ever a virgin, abides always in virginity. It was fitting that this virginity, be born of chastity. Like a pair of doves, Joachim and Anna! You, having chastely observed the laws of nature, have been granted by God that which is above nature, and have brought into the world the Virgin Mother of God. While in the flesh, you have piously and virtuously borne a daughter who is higher than the angels and reigns over them. Most fair and sweet Daughter! Lily, sprung up in the midst of tares from a root most noble and august! By you the royal priesthood has been enriched!" With words such as these does the Holy Damascene clearly indicate the manner of parents who bore the Mother of God, and of what costly materials the palace of the Heavenly King was erected. Where was this living palace built? In a most exalted place, as the Church testifies, saying,"Truly you are higher than all things, O Pure Virgin. "2 Nevertheless, it was not so in respect to locality, but rather her virtues and God's benefactions. The place where the Most Blessed Virgin was born was a little town in the land of Galilee called Nazareth, which was subject to the city of Capernaum. It was inglorious and obscure, and its inhabitants were held in disdain, even as it was once said of Christ, "Can any good thing come out of Nazareth" [Jn. 1]? But the Lord, "Who dwells on high and looks down on things that are lowly" [Ps. 112], was well pleased that His Most Pure Mother be born not in Capernaum, which in its pride was lifted up to heaven, but rather in humble Nazareth, indicating that that "which is highly esteemed among men is abomination in the sight of God" [Lk. 16], while that which is despised and disdained by them is regarded by Him as lofty and honorable. Moreover, by its very name Nazareth hints the height of the virtues of the Most Pure Virgin. For as by His nativity in Bethlehem, which name means "House of Bread", the Lord mystically signified that He is the Bread come down from heaven for the life and strength of men. So by the birth of His Most Pure Mother in Nazareth He denotes sublime things. For the name "Nazareth" means a blossoming place, sacred, removed from the things of this world, adorned as it were, with a crown, and guarded. All these epithets are clearly applicable to the Most Pure Virgin, for she is the flower sprung up from the withered tree of a barren and aged womb, which has renewed our nature which has shriveled with age. She is the flower which does not wilt, but ever blossoms with virginity. She is the most fragrant flower, giving birth to the fragrance of the only King. She is the flower which bears the Fruit which is Christ the Lord, the flower which alone has borne the fragrant Apple. She is sanctified by the grace of the Holy Spirit which has descended upon her and has overshadowed her. She is the holiest of all the saints, as she has borne the Word, Who Himself is more holy than all the Saints. She is excluded from the ranks of the sinners of this world, for throughout her life not even once did she know sin. All of us must say with David, "I know mine iniquity and my sin is ever before me" [Ps. 50], but she alone can say, "Without iniquity I ran, and directed my steps" [Ps. 58]. She is the guide of all men, who hath not only committed no sin herself, but also turns sinners from wicked deeds, even as the Church cries out to her, "Rejoice, you who dost rescues us from the works of mire. "3 She is crowned with glory and honor; crowned with glory, because she has blossomed from a royal root; crowned with honor, because she has sprung from a high-priestly line. She is crowned with glory, having come forth from glorious, chaste and righteous parents. She is crowned with honor, for she was esteemed worthy of the Angel's glad tidings and his attendance. She is crowned with glory, as the Mother of God, for what could be more glorious than to bear God? She is crowned with honor as the Ever-Virgin, for what could be more honorable than to remain a virgin even after giving birth? She is crowned with glory, more glorious than the Seraphim, possessed of love for God like that of the Seraphim. She is crowned with honor, more honorable than the Cherubim, having surpassed the Seraphim in wisdom and knowledge of the Divinity. "Glory, honor and peace to every man who works good" [Rom. 2], says the Apostle, and who among the earthborn surpasses the Most Pure Virgin in deeds of virtue? Having fulfilled all the commandments of the Lord, having done all His will, observed all His injunctions, kept all His sayings in her heart, and performed every sort of good deed to her neighbors, she is worthy to be crowned, as one who works all manner of good. She is likewise a repository, in which the treasure of her virginal chastity is guarded so carefully, that not even unto the Angel did she wish to entrust it. Upon seeing the Angel, she was troubled at his words, and considered in her mind what manner of salutation this might be. All these things concerning the Most Pure Virgin are signified by the Name "Nazareth." With what sort of beauty is this noetic palace of Christ adorned? Listen to the sweet words John of Damascus, who speaks of her thus, "She was offered to God, the King of All, clad in the splendor of virtues, as it were, in a vesture of gold, and adorned in the grace of the Holy Spirit. All her glory is within, for while every wife derives glory from without, from her husband, the glory of the Theotokos is from within, that is to say, the Fruit of her womb. And again he says, "O Virgin, full of God's grace, O holy temple of God, which Solomon who created the world has erected and in which He has dwelt! Not with gold, nor with inanimate stones are you adorned. In stead of gold, the Spirit shines in you; in place of precious stones, you have Christ within you, the Pearl of great price. Such is the adornment of this palace, the beauty of which far exceeds that of Solomon's temple, in which were depicted the Cherubim, trees, and flowers. Likewise, in this animate temple, in the Most Pure Virgin, a semblance to the Cherubim may be seen; for by her manner of life, which was like that of the Cherubim, she was not only the equal of the Cherubim, but surpassed them. If the Church frequently refers to other Saints as Cherubim, singing, "What shall we call you, O Saints? Cherubim, for Christ has rested upon you,"5 how much more is the Virgin Theotokos like a Cherub? For within her Christ abode in the flesh, and in her most immaculate hands God sat as though upon a throne: Therefore is she called a Cherubic throne. Moreover, in her person the likeness of fertile trees is depicted, for spiritually she is like a fruitful olive tree or a blooming date-palm in the house of the Lord [Ps. 51]. Therefore, she is now called the life-giving garden, as the Church sings , "From a barren root the God of wonders has made a life-bearing garden to spring up for us: His Mother. "6 All this is said in respect to her spiritual beauty, but she was not lacking in physical beauty. Many of the teachers of the Church testify that there has never been, nor shall ever be a virgin as fair as the Virgin Theotokos. When Saint Dionysius the Areopagite saw her, he would have called her God, had he not known that God was born of her. Divine grace, with which she was filled, shone forth brilliantly from her face. Such was the palace which the Heavenly King prepared beforehand on earth! She was beautiful in both soul and body, "as a bride adorned for her husband" [Rev. 21], and, what is more, exceeding spacious: "Your womb He made more spacious than the heavens", and therein Christ, God uncontainable, has been contained. Palaces are usually constructed in such a manner that not only the King, but a multitude of his attendant servants and those who come to him from throughout the world may by amply accommodated. The spacious abode of the Word, the Most Pure Virgin, accommodates not only God the Word as King, but also us His servants, who draw close to God, Who dwells in her. She contains both God and us in her womb, in her compassionate bosom. The chosen and holy vessel, the Apostle Paul, moved by compassion, said to his beloved, spiritual children, "Our heart is enlarged; ye are not straitened in us" [2 Cor. 6]. In which of the Saints may be found such all-embracing, Divine compassion as in the Virgin Mary? Here the chaste are accommodated, and the sinner is not excluded. Here the penitent has his place, while he who is despairing and unrepentant has a refuge like a new ark which shelters not only clean, but unclean animals as well; its entrance is not barred. Her compassion easily accommodates all those who sorrow, who are offended, who hunger, who are strangers, who are troubled, and who are sick. For it is not possible for her to be lacking in mercy, whose womb bore for us the Gracious God. The palaces of earthly kings are guarded by armed guards, who do not allow everyone desirous to enter therein to do so, but rather stop and carefully question everyone as to why they have come. But as for the living palace of Christ, although she is surrounded by Cherubim and Seraphim, by the innumerable choirs of Angels, and by all the Saints, at the doors of her compassionate mercy no one hinders anyone who is desirous of entering, neither do the guards expel anyone, nor do soldiers drive anyone away after having questioned him as to why he has come, but having prayerfully entered, he receives a gift which profits him according to his petition. Thus, let us hasten to the compassionate bosom of her who was born of a barren womb, hailing her thus, "Rejoice, O immaculate palace of the King of All! Rejoice, dwelling place of God and of the Word! To Him, together with the Father and the Holy Spirit, and to you, O Daughter of the Father, Mother of the Son, and Bride of the Holy Spirit, be honor and glory from us mortals unto the ages, Amen. 1. All quotes by St. John the Damascene are taken from his Homily on the Nativity of the Most Pure Theotokos. 2. Canon for the Feast of the Entrance of the Most Holy Theotokos, Ode 9. 3. 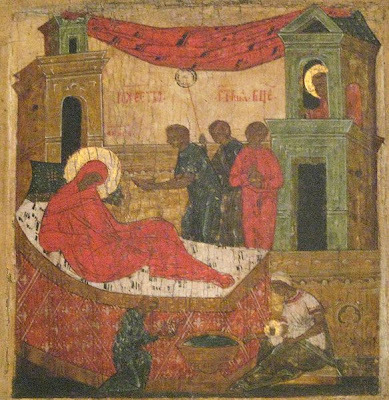 Akathist to the Theotokos, Oikos 5. 5. Sticheron to the Martyrs from the Octoechos, Aposticha in Tone 8 for Friday. 6. From the Sticheron of Vespers for the feast.